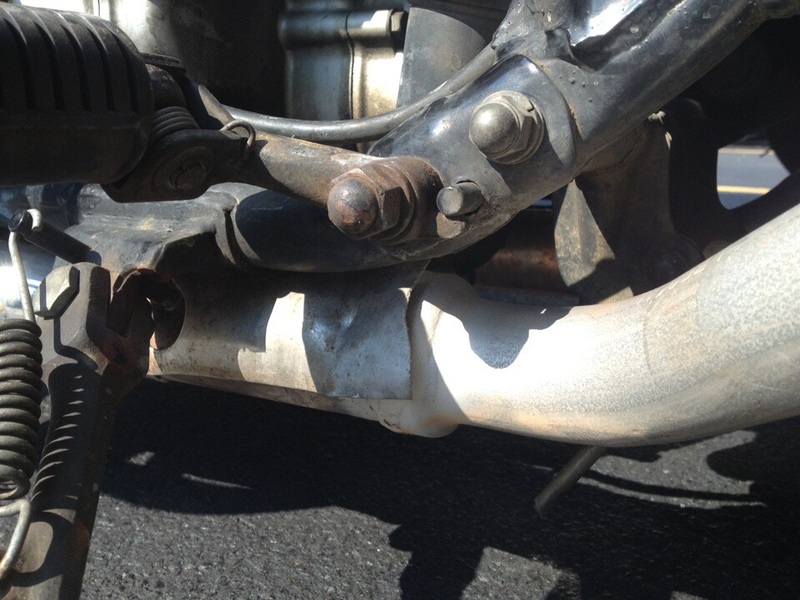 Steve Saunders Goldwing Forums > Forums > Goldwing Technical Forum > 1200 Muffler replacement? My 86 1200 Aspy had muffler leaks and found the tabs around the headers were rusted out. Headers are still good. Anyone know of a good slip-on HD muffler that would work? I did this mod to a GL1100 some years ago. I think I used new take off mufflers from a RoadGlide . I had to have a auto muffler shop bend a pair of "S" pipes to make the offset to a point where I could have the mufflers mounted and look proper. IIRC the "S" pipe is about 10" long. I did the same as Mike. I found a hot rod shop with a mandible bender that could put the rather sharp bends into small diameter pipe. He welded the S-pipe to the header. Bruce, thanks for sharing the picture . I didnt have any. Might be one of those "bite the bullet" times. You can get decent OEMs for under 200 bucks on eBay. Thanks everyone for the advice. For now, as I am not working, any new pipes are out of the question. So, I'm going to look into doing the S-shaped sections. I located a pair of HD mufflers that look similar to Mike's. Any ideas on how to mock up the S-Shape pipes? Wow, that is a really nice job. Pretty clean job. Do you remember the pipe diameter? I’ll try to remember to get the pipe OD next time I’m in the garage. 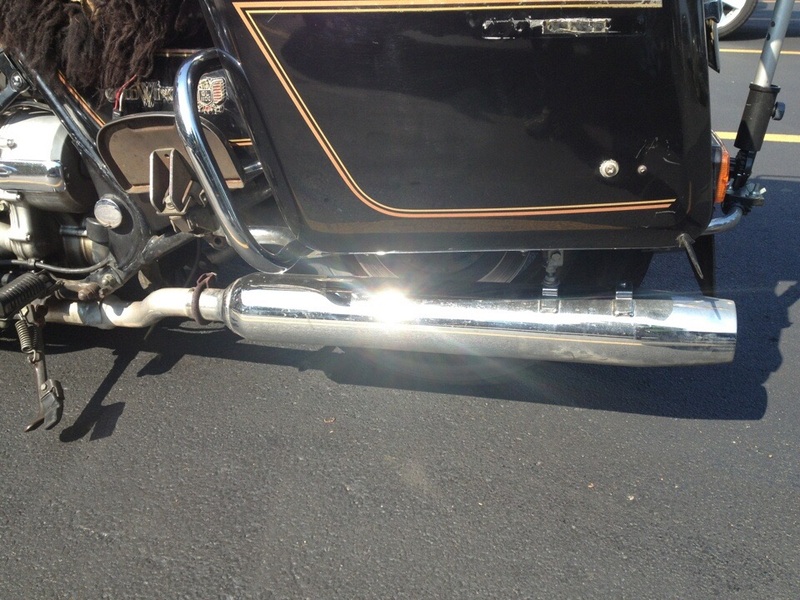 To bend the pipe, the hot rod shop used a special bender called a mandrel bender to prevent the pipe from collapsing. Getting those custom mid-pipes plus the welding wasn’t cheap, maybe Dennis is onto something with OEMs off FeeBay. 2 HD take off's... $40 for 2 off flea bay. 80dB @ 3000 RPM's is PLENTY "loud" ... enough to make my ears ring when I am done riding... need hearing protection or full face helmet. I wud NOT weld them, slip fit them with plenty of ANTI SEIZE so they can come off if u have to take the pipes off to replace the rear tire/slide axle out as they are IN THE WAY of the whole remove the back tire thing, trust me on that. so much easier to take the mufflers off if put ANTI SEIZE on everything, including the muffler clamps. SHOPS cant/wont take the extra minute to go find the antisieze and then the pipes are corroded to the other pipes and wont come apart. went to store the other day, looked in their store house.... 2+ cases of anti seize on the shelf and I KNOW they never use any of it as ... it takes time and makes a mess and they will cry if they get their hands dirty... and they probably wont ever have to work on it again so they don't care. yes it will smoke for a while when u start it til the excess anti seize burns off in a few mins, no big deal. it is HIGH TEMP copper coat stuff. the S bend is not much... ~half the diameter of the pipe, just a little zig in the pipe. sand/scuff and paint the pipe with high temp paint. the galvanized coating wears off and then it rusts and looks bad. WEAR DUST MASK! zinc poisoning will put u in the hospital... welders DO NOT like to weld Zink/galvanized coated bolts because of the possibility of inhaling the fumes/going to hospital with zinc poisoning. see if welder has bolts in stock in the 3" x 1/8"? that are not Zink coated will have to sand the galvanizing off the pipe, put scratches in it so paint has something to adhere to, HIGH TEMP paint after u have wiped off fingerprints etc. off the pipe and let it dry in the sun. if all else fails... READ THE DIRECTIONS, on the can. I used ...3" carriage bolts with the bolt head welded to original HD, threads facing up, mounts as the 1" square pipe that... originally held the factory pipes? lined up, mine lined up exactly with the HD pipe mounts (ur results may vary). I got the bike used with HD pipes so I don't know if those mounts were there or made in the pipe? that way the threads are facing up and put washers and nut on the top and let them hang. can have welder make some spacers of.... ~3/4" x ~1/4" hole for bolt or so to fit between the twice pipes and the 1" square bar that held the original mufflers, so the pipes don't swing around under the bike... they are not going to swing that far without the spacer, where can they go? if double nut the top or use blue thread lock on the top nut when u are done. the spacers are an exercise in patience since the 3rd hand/arm is a little slow in coming. after futzing with the spacers u had made... u figure they are NOT worth it and let the pipes hang down <1" from the muffler mount on bike. double nut it, blue thread lock when u get it where u want it? 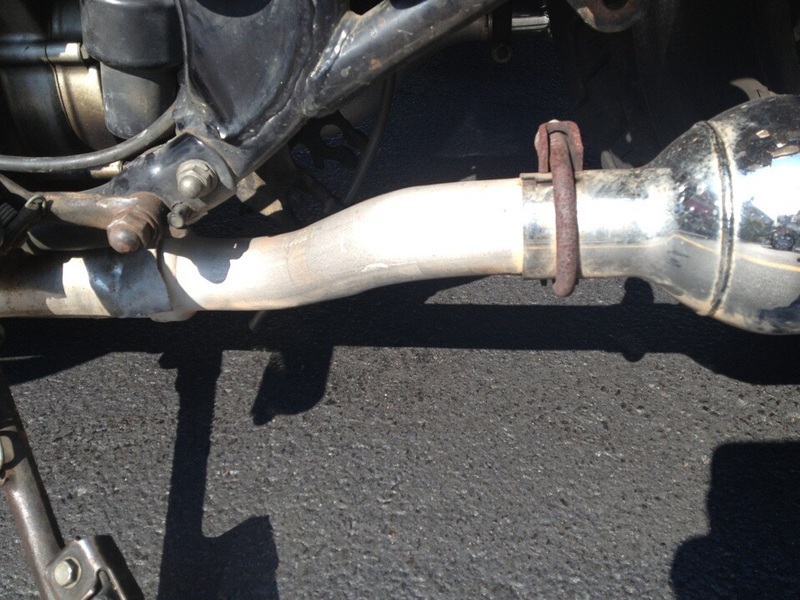 one on either side of the 1" square tubing that held the factory mufflers. double nut the top so the nut doesn't fall off and the pipe drops/falls on ground at an inopportune moment. mine were a little long 3"? as I was trying to get the pipes UP (they don't need to be UP, wont drag them without dragging other HARD parts long before) I drilled little hole in bottom of the saddlebag (I didn't need to, but ..) for bolt threads to stuck thru... when realized... pipes don't need to be that far up (I suppose that is what the spacers are for? still really don't need them, pipes will hang fine with double nuts on the top or blue thread lock). cld use washers as spacers, that wud be easier as can add/remove to adjust space tween twice pipe mount and the twice pipe. if take the headers off, might back the stud out instead of taking the nut off. no big deal, anti seize it when put it back together. HOSE IT DOWN exhaust studs WITH WD SEVERAL TIMES before trying to take off exhaust stud nuts as exhaust studs tend to break off from too many heat/cool cycles that makes the metal brittle!!!!! judicious use of torque on the exhaust fasteners to get them loose is suggested as U DO NOT WANT TO BREAK OFF THE EXHAUST STUDS IN THE HEAD!!!!! I even glop anti seize on the exposed threads on things like that, after reassembly, in the splash area of machines so the exposed threads are coated for corrosion inhibition. clean the threads with WD and a little wire brush things should go easier on things like that. let WD stay on the threads ... overnight at least. it will burn off when u start the bike. if real fussy, put grease on clean'ish threads when taking the nuts off the studs so hopefully don't have to FIGHT The nut off ALL THE WAY. 8mm stud with 12mm nuts? maybe u will be lucky and the person before u didn't lose the MM nuts are replace them with SAE nuts that fit... but not right and have to be "walked" all the way off the stud, but will come off easy enough with ratchet n extension to reach up thru the header. might want to look at that shifter shaft seal? bearing wears, seal leaks and it will be right there if u take the header off... and shifter lever 10mm bolt. seal is ~$6 on e bay and drill little holes (2 shd do opposite each other) in the old seal, put screws in the seal, pull out with vise grips. lubricate new seal (I used grease), tap back in with appropriate sized socket n small hammer. grease it up well first of course so seal lasts a while and wont leak... as bad when it does leak. I read somewhere that they had a problem with the seal and the bearing behind it... from ppl stomping on the shifter lever? and bearing going bad and then the seal going bad.. perpetually?